I can't predict which designs will be popular. However, there are some things I sort of "fall for." I'm not in love with every design I do. Some are useful or creative but maybe wouldn't fit me personally or work in my household. That's ok! Designing allows my imagination to explore things that might not be my thing but they work well for others. For instance...when I was a kid, I fell in love with the notion of Bermuda Bags. I loved that you could take off one cover, button on a new cover, and --wow--a whole new bag without having to take your stuff out of the actual hand bag! That seemed great and very matchy-matchy. When I found a new retro equivalent of these bags, I thought it would be super to design bag covers. I loved doing it...and the Pin Check Bermuda Bag in Knit Green is one of my favorites. That said, I didn't use a purse consistently until I had to. Pockets also work fine and I like purses with long straps. I put them across my body like a messenger bag, and that leaves my hands free to hold dogs' leashes, grocery bags, knitting, etc. So, while the Bermuda Bag is still in my possession, at least for now, it's part of my trunk show and not part of my wardrobe. This book writing thing has been a big learning experience. I sometimes feel discouraged about having such public commentary all the time. It can be upsetting...and I can't figure why some people enjoy saying recreationally critical things about other people's professional work. (it's just not something I'd do if I could avoid it, it's part of the "when you can't say something nice, don't say anything at all..." school of thought.) Constructive criticism, ok, I get that, but otherwise? just not my thing. In coping with this, most of the time I feel relatively quirky about it all. That's obviously the reaction I get when I tell non-knitters what my books are about. ("Weird!" is their reaction.) Sometimes, when a kind person pops a nice review up on Amazon, I'm very proud and grateful . I want to write those folks thank you notes! Mostly, though, I'm just a regular person, and this sudden launch into the knitworld's "public" has been bewildering. I can never predict which designs will be popular. I also could never have known what this would be like. It's nice to know the world keeps offering me new and challenging experiences. In the meanwhile, there's been a hiatus on the designing front. I'm blinking a bit, trying to find my place in a new city, and figure out who I want to "be" now. Plus, I have all this backlog of designs to finally talk about. A year ago, I was knitting the zafu and math mobile in Kentucky. (scroll down to the end of the post to see those "in progress" photos) Now I'm in Winnipeg and the book is done! Who knows what next year will bring? We have heat again as of about 8pm tonight. I feel as if my brain has just been turned back on. 45F (around 8C) is not cold outside. It is pretty darn cold inside, though. I became a not-nice person who alternately baked a lot (corn bread, whole wheat bread, apple pie, fudge brownie pie and stew, all since Thursday) and became dumb with cold and fatigue. Outside felt warm. Inside felt too cold to do anything of much use. Hopefully I'll be twice as productive now that the heat is working. I'll need to be, since it cost us several thousand dollars to fix! Regular blog posting may commence again soon. In the meanwhile, check out this great review of Knit Green (scroll down, it's the second book reviewed.) I also got to speak with Guido Stein of the It's a Purl, Man podcast. I think he'll be posting that interview later this week. I am off to enjoy sleeping in a warm house. It's amazing how this is such a novelty, but after over a week without heat? Well, it's a novelty! Pretty much every animal I saw at Rhinebeck was bedded down in straw, huddled up with a friend or just chewing his cud. This llama was definitely cuddled up, too. That's because the weather was cold, damp and raw. Our wonderful old house has offered us a lot of surprises since we've moved in. The newest quirk is that the pump on our hot water heat has broken. At least, that's what we think has happened. The professor called repair folks last Thursday. This is the "shoulder" season, in which having heat would be nice but it's not a necessity. The temperatures are between about 0C and 8C or somewhere between 32F and 46F, which means our pipes aren't freezing if the heat isn't on. Therefore, it's not an emergency and we can theoretically wait patiently until our repair appointment...which is tomorrow. We have a couple of space heaters, and if we keep the door to our bedroom closed, and the heater is on, it can warm up nicely. Otherwise, well, leaving this room can be nippy, since the house is only a few degrees warmer than the outside temperatures. Eating? cold. Going to the bathroom? Like going to an outhouse. Downright chilly. I'm wearing my woolies. Today? A camisole, cashmere turtleneck and a wool shetland sweater. Jeans (not warm enough! ), a pair of wool socks and my shearling slippers. I am wearing a hat at all times, too. 7) I am already thinking about heat and spring. The weather this year at Rhinebeck was cold and rainy. While I'm glad it wasn't snow, (which lingered in the weather reports...) it was still kind of raw outside. Here's a brief summary of my adventures. I did have to keep my signing pen in my pocket so that it would stay warm enough to work when folks wanted their books signed. As well, I wore a hat, scarf, coat, and even mittens for portions of the book signing..it was indoors, but the temperature was brisk! I also got a chance to visit with some other writers for a moment or two, which was fun. Towards the end of my book signing time, my father-in-law came by to say hello. We had a family lunch together while listening to some young fiddlers perform. They were super! After that, I had just an hour or two to wander around. I got to see my friend Annmarie at the Year of the Fleece exhibit. She was showing off the scarf that her elementary school students knit! She is a teacher, and her students learned to knit and made a scarf for this! She was so proud! I also visited some of the animals, including the Leicester Longwool sheep. They were the featured breed at the festival this year, and I have admired the breed for years. Long ago, Colonial Williamsburg had one of the first flocks I knew of, and they kindly would sell me a pound or two to spin up. This is such a lustrous and beautifully strong wool..I still love it. Also, the sheep themselves are just peaceful souls...the area where they nestled in their bedding was a quiet respite in the midst of the fair's rainy hustle and bustle! Towards 2:30 pm, it was time to head back, as it was a 6 hour drive to my parents' house in Virginia. My mother shared her shopping adventures with me as I drove back through the rainy afternoon and evening. It was a whirlwind trip. On Monday morning, we had a big family breakfast. My uncle, my nephews, my brother and his wife, my parents, grandmother and I were all enjoying the last bits of french toast and fruit, coffee, tea and juice when my mom went downstairs. She stopped on the landing between the sets of steps to announce the S-N-A-K-E she saw downstairs. My uncle (who had been sleeping downstairs, as I had) turned white. Nephews (nearly 4 and 1, were kept upstairs.) My brother rushed down -wearing sandals. I had on shoes, went out right past the snake, down the hall to the garage, got a shovel, and, well, there was a violent and premeditated snake death. I did it. There's something of a debate about the snake variety, it could be a rat snake or even possibly a copperhead. We're unsure. I disposed of its remains before we could discuss the matter with my youngest brother, who actually took a herpetology class in college. Anyhow, I'm keeping the shovel inside until I leave. My uncle got his bags and left for the airport a wee bit on the early side! My dad keeps suggesting I go downstairs first, turn on the lights, and scare the critters away. Apparently I am the brave daughter here! It's getting to the point in my visit home where I am missing my house, my dogs, and the professor. I realize now that my dogs' frequent snake adventures have trained me well for this. It's gross, I'm not enjoying it, but hey, somebody needs to have confidence with a shovel. Meanwhile, I heard from the professor that the pump that circulates hot water in our boiler system heat isn't working, up in Winnipeg. Better to get that fixed now than in January...but I'm feeling an odd relationship to the Yarn Harlot right now, as she is having her furnace replaced. (I hope we don't have to!) Perhaps it's all for the best that I'm protecting my family from snakes down here in the basement in Virginia at the moment. Last slithery topic--I had a circular needle break at the join... Right after I knit the cable row on the beginning of a sweater with over 170 stitches on the needle. Those stitches popped off like a snake on the loose. Luckily, I was in the basement--right near my mother's needles. All stitches have now been rescued. Messy, but not fatal. My nephew's b-day was a big hit. Lots and lots of people came and everyone had a ball. It was fun although I was pretty dehydrated and over tired from my flight. Nephew himself is doing very well. He's still got serious delays (wow, a lot of delays) but he is smiling at people, grasping at noses and waving a little. He can stand (with help) and seems to be doing a lot of neat baby behaviors, even if they are happening a bit later than usual. Not normal by any stretch of the imagination, but good. For the most part, I'm avoiding the details, as he and his family deserve their privacy. Still and all, even including the stomach feeding tube, compared to last year, things are good. My first flight, from Winnipeg to Ottawa, was great--lots of room to stretch out and knit and enjoy myself. I had a very peculiar experience on my second flight from Ottawa to DC. A large older gentleman, sort of olive skinned, with a beard and a nicely cut gray pinstripe suit, was sitting in the wrong seat. He was redirected to the seat next to mine and he made peremptory humphing noises in frustration. He settled in, stretched out, and proceeded to take up 1and 1/2 seats. (half of mine.) He stretched his legs out, fell asleep with his hands cradling his crotch, and started to snore. He had a bit of food in his beard. I figured out after a while that he had little or no English at all. I was wearing Doc Martens and sort of fought back when he started nudging my leg over even further. He was touching me (not sexually, just inappropriately) and oozing over in my seat! I finally lost my temper entirely when I lifted up my cup of water and he was touching the side of my body under my arm right around my bust. I whipped out my best "sharp elbow" and gave him a good shove. He looked very surprised but gave me a bit more room after that. Needless to say, there was no room to knit. I could barely read without having to guard my personal space. I was thrilled with relief when the 1.5 hour flight was over and got off the plane---but then shocked to find a guy in army fatigues, a secret service guy and several other armed gentlemen received this man cordially right as he stepped off the plane. I walked away with a brisk hustle but then discovered that unfortunately, I was keeping pace with this entourage. The guy had at least 2 or three interpreters as well as the military men and a couple of onlookers. I kept pace so well that the secret security police looked worried....entirely coincidental. I got my luggage off the baggage claim. As I left, I asked a guy with a gun who was standing guard who this "important" guy was. He was a General. From Afghanistan. I explained that I'd not known that and elbowed the heck out of him when he kept getting into my seat space. The guy with the gun grinned, he thought that was hilarious. I told the guy to keep the general safe and went out to meet my dad's car. Just another ordinary flight to Washington, D.C., I guess! Later, I did a little searching. Here's the guy who sat next to me. Here's what he looks like when he's not snoring, in uniform, and doing his job. Something like the equivalent of Canada's Chief of the Defence Staff General. He was flying from meetings with the Canadian military and government folks to meetings with the U.S. military and government folks. Oh. My dad and I wondered why he was flying without an entourage right beside him, but mostly, I commented about the most important thing I'd learned. Growing up in D.C., I learned that even very important folks put on their pants one leg at a time. I don't feel bad about the sharp elbow...all polite indicators of discomfort had failed. Only the professor and a very few others (like my nephews or my dogs...) get to be that snuggly with me on trips! Travelling provides for lots of adventures, doesn't it!? Even Winnipeg doesn’t expect snow in early October. The weather report predicted flurries, so I packed on Friday with confidence. Early the next day, we headed to the airport—in about 4-5 inches of snow. No plowing had happened overnight, because nobody had expected a storm yet! We still have green leaves on all the trees! So, the professor and I made it just fine to the airport (15 minutes away, as compared to the 70 miles we had to go to Nashville when we lived in Kentucky) and I cheerfully joined the long lines. About an hour and a half later, it became clear I wasn’t going anywhere. Apparently a plane had gone off the runway the night before in the slippery conditions, and only one runway was working. The booking agent looked relieved when I just asked if I could have a “do over” for Sunday. I called the professor again, bought myself a cup of tea and a couple of t-shirts for relatives, and went home at 9AM to spend the day at home. Since I was all packed and ready to go, the day was there to enjoy! We took a long walk, had lunch at a nice neighborhood bistro, and I took a nap. I knit. I cuddled with dogs. All in all, a great break. Today, I got to the airport bright and early (on completely dry and clear streets), took a mostly empty flight to Ottawa, and now I’m waiting for the next leg of my trip to DC. It’s been a peaceful trip so far. Sometimes, it’s just better to try again later. I promised that every post for a while would have a bit of Knit Green in it, and here’s today’s. A year ago, at this time, I was knitting up the Spire Smock sample for the book. When I chose the color of the yarn, I had to think—what would look good in the photography? Would the color be appealing to knitters? I looked at the Vermont Fiber Company’s O-wool classic color card over and over. I could not resist the Saffron shade. Now, I look pretty bad in orange colors, and this color was no exception, so I’d never chosen it on my own for a personal project. However, getting to knit this cardigan for the book gave me a special learning experience. During the darkest days of fall, I couldn’t wait to sit down and work on this project. The rich crocus colored orange just sang in my hands and truly lifted my mood. Every day (and this project took something in the range of 6 weeks to complete) I yearned towards the coffee table, where I’d left the project. I couldn’t wait to knit that saffron colored woolly goodness again. Who does this color suit? Perhaps anyone with dark skin, or light skin and red hair… Really, anyone with a sense of daring should try saffron…especially if you wear a more flattering turtleneck underneath. Of course, this cardigan can be knit in most any solid color yarn that gets the right gauge, but if I had to do this again to create a sample, I’d still choose O-wool. A firm twist and a somewhat crisp hand makes this textured pattern pop. Not all the patterns I design suit me. The style might not be right for my body type, or the color might be a problem for me. However, I still strive to create things with classic style and clean lines—things I’d like to wear. If I only were tall and skinny, dark skinned or a red head…I can dream. In the meanwhile, I hope other knitters see this kind of a design as a “bonus” treat. That is, an additional pattern that’s perfect for them, even if it’s an unexpected color, style, or not even why you might buy Knit Green. 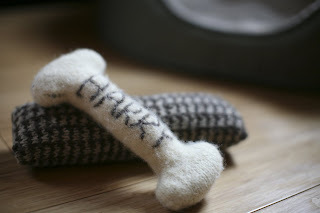 I really like knitting (and designing) things for my house. After all, you can only wear so many handknits at once, but your house? Well, your house can "wear" a lot more knitting at once! For Knit Green, I explored a few concepts that the professor and I have worked on in our home. A while ago, we decided to transition to using only cloth napkins. This wasn't a hard transition as the dirty napkins rarely amount to anything near even a small load of laundry, and we saved money on buying paper napkins. It also saves energy--no trees being made into napkins, no trees cut down and trucked out to be processed, no napkins trucked into the grocery store for us, etc. Yes, everywhere else still uses paper napkins...but we can only make a difference a little at a time! Of course, (since I'm a knitter), I started coming up with knitted napkin ideas. First came these napkins, and they're for sale on my website as a download. For Knit Green, I broke out of t he neutral colors and went for brighter colors! (Note: brighter colors also hide more dirt and stains!) 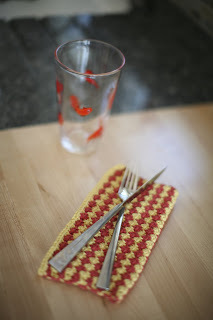 Here are Waves and Stars: Knitted Napkins....another couple of patterns in the book. This is one of those situations where the book says there are 20 patterns, but technically there are two patterns here, not just one at a time, so you're getting more patterns for your money! If you choose machine washable and dryable yarns (cotton or cotton blends work well), these napkins are work horses. Use and enjoy them, throw them in the wash, and put them right back out on the table. They're fast to knit, too! 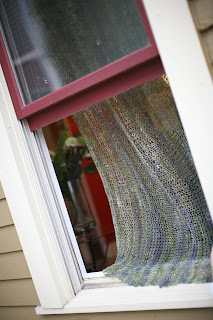 Another fast project are these knitted curtains. They are designed to use either a regular curtain rod (cafe curtains) or to use a decorative curtain rod with little knitted button tab loops. The sample cu rtain is made from a friend's handspun, but any sportweight yarn will do, and the project is fairly flexible. It's ideal for a little simple knitted interior decoration! 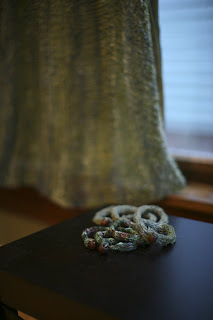 I'm hoping to find time to make more curtains like this for my new (old) house. We've got long windows, perfect for this kind of window treatment. In other news, I'm off to Virginia (near Washington, D.C.) and New York this weekend. I'll be seeing family, hopefully teaching and signing books, and going to Rhinebeck, aka New York State Sheep and Wool Festival, to sign books. I'll try to keep posting about the projects in Knit Green in the meanwhile! If you're going to be at the festival, come by and see me on Sunday, October 18th, from 10-12 as I sign books! Can't wait to see you! So, do you like knitting for your home? What projects do you like best? Ever considered knitted napkins or curtains? 2) It c an be knit with DK weight yarn. 3) It's textured enough to be interesting knitting without being too complicated to figure out. I memorized the pattern quickly and knit away on this. Another design I've posted is called the Cozy Zip-Up Cardigan. This is a unisex design and it comes in multiple sizes from XS (36") to XXL (57"). Sadly, the studly model does not come with the book or pattern! However, this design knits up very quickly and is very cuddly. I tried to imagine my husband, the professor, and his preferences when I designed this. I've knit only 2 sweaters for him, since there aren't many patterns for folks who need a 56" sweater. (That's 52"+4" ease) With #13(9mm) needles, this project will fly by! I've also taken the plunge on another part of this project. Ravelry has affinity groups and forums for discussion. For months, I've been trying to convince myself to start a group. Every time I considered it, my inner dwarf (Bashful) popped up. I just felt too self-conscious to do it! Well, a friend of mine stepped right in and set it up for me! If you're on this ginormous knitting database already, please, join in! This "slowly but surely" technique is the way we're tackling the rest of our moving in as well. Every day, something gets hung on the walls, or unpacked, or fixed. We find out something new about the house...or about Winnipeg. Yesterday, we closed storm windows and tried to get into the attic. The storm windows? successful, for the most part. The attic? Well, let's just say we haven't gotten in there yet. No idea if it has sufficient insulation, since we haven't found a way in yet! The only thing that hasn't been going slowly is our social lives. We've been to two sukkahs to celebrate Sukkot so far. We're going to a third one tonight! We also got to go to a special wine and cheese party where lots of people brought their homemade wines and there was a wine tasting competition! That was the weekend. In comparison? The weekdays look relaxing...! Have you seen that moon?! Gosh it's full and beautiful...hope you can see it where you are, too. On Sunday, I left the knitting retreat and rushed home to get ready for Yom Kippur, one of the Jewish high holidays, the Day of Atonement. The professor and I have moved several times, but attending a new congregation is always somewhat jarring. Most people observe these holidays with their families and friends. It's hard to move in the summertime and know very few people at the start of a new (Jewish) year! This time, though, it was different. The family (a rabbi and his wife and their daughter and son-in-law) who ran these "alternative" services were already connected to us. One of their sons had been our rabbi in Nashville. This special service was a once a year, intimate and small congregation and we were introduced and welcomed into their Winnipeg community. We were asked to participate in the service. Then, their son-in-law gave a talk about Jonah, with a handout which included lots of rabbinic and academic commentary. The last quote on the page...was one of my favorite professors from graduate school at UNC-Chapel Hill. I was bowled over! After the holiday was over, I was able to email a copy of the handout to this favorite professor, who also happens to be a member of that congregation in Nashville. Every single person in this exchange, (from Winnipeg to Nashville and back) was surprised, honored, and pleased as punch to get to make a connection like this, so many thousands of miles from home..wherever home is. I promised I'd explain how this relates to a knee sock and knitting, I know. (seem far fetched?-just wait.) A few years ago, I made this one sample sock out of a cotton sock yarn. Fortissima Cotton, in a color that is hard to photograph! I made one sock. For whatever reason, no one wanted the pattern at the time. On my travels in 2007 to write Fiber Gathering, I found some amazing Cormo yarn from Elsa Wool Company sold both at Estes Park and Taos wool festivals. I knew it would become these knee socks. Soft, supple, and as soulful as a fabric can be, I fell in love with its texture as I knitted. While this pattern is relatively simple, it requires attention. Each stitch must be connected to the next. You can't drop one. You can't forget about the pattern completely. It draws you back in to attend to it, every other row. One row stockinette, one row of ploughed acre lace. When I finished the sample socks for the book, I knew I wasn't done making these knee socks. I found some Bo Peep Not Just for Socks yarn in two colors in Greenwich, NY last fall, and I knew the charcoal color would be perfect for my own personal pair. I also liked how the yarn connected me to Tracy and Jeff's story. (Click on the link to my post on Greenwich for more.) In short, Tracy's friends kept her yarn shop open while she was ill. When I visited, I bought yarn not just to knit, but to celebrate our connections and how they keep yarn shops open! It's how each person links us, with care, to the next thing, to those past and present and future people. More projects will be introduced soon!